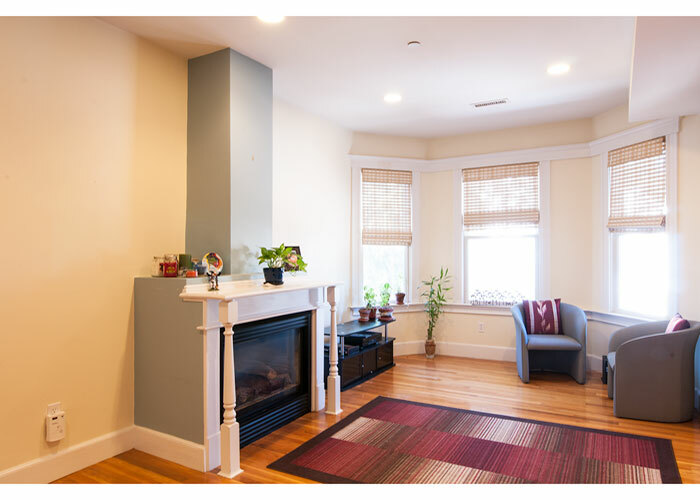 Nicely situated in Central Square Cambridge this newly renovated, 2 bedroom, 2 bathroom home is perfect for small families, couples and room mates either attending graduate school or working in the Kendall, Harvard or Central Square area. Extremely convenient to Central Square T stop and close to all the restaurants, shops and entertainment venues that Central Square has to offer this location is also very quiet as it is nestled in a garden like setting with a park in the back and a back deck for resting, relaxation and entertaining. The apartment itself is very spacious with exposed brick, nicely proportioned rooms, generous kitchen and two lovely marble tiled bathrooms. Through french doors off the living room that includes a working fireplace with mantle is a space that would make a very comfortable office or nursery. the unit comes with a washer and dryer and very useful california closet system in the master bedroom. For a private showing of this comfortable and modern home please give Tom Brooks a call at 339-927-1904 or email me at tom@paragonproperties.com.